Strawberry buttercream is sweet, zingy, and easy to make. This delicious frosting uses a fresh strawberry reduction kissed with lemon for it’s flavor and color. No need for food coloring! No need for the artificial coloring of flavors with this all natural icing! You’ll get an amazing kick of strawberries with each bite. You can use this same reduction to flavor Italian meringue buttercream or Swiss meringue buttercream too! 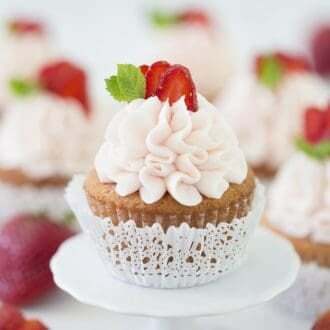 I have to mention that this buttercream pairs PERFECTLY with my fresh strawberry cupcakes! Cream 1 cup of butter and add in about one pound of powdered sugar. Add 1/4 cup of strawberry reduction. 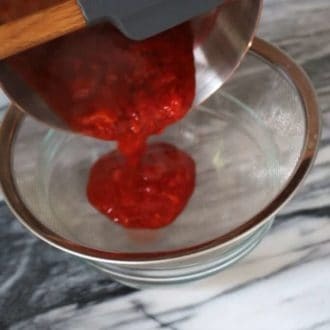 You can also use a strained jam/strawberry preserve as a time saver. 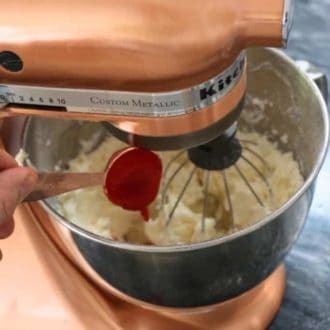 For a less sweet alternative try mixing up a batch of Swiss or Italian meringue buttercream and flavor with the strawberry reduction. Add a tablespoon at a time in until the desired flavor is achieved. How do you make strawberry frosting with powdered sugar? Whip up a batch of vanilla buttercream with room temperature butter then add in powdered sugar. Make sure to sift the sugar, especially if you’re planning on piping as clumps will clog the tips. Mix until light and fluffy. Add in the strawberry reduction or strained jam and whip until incorporated. 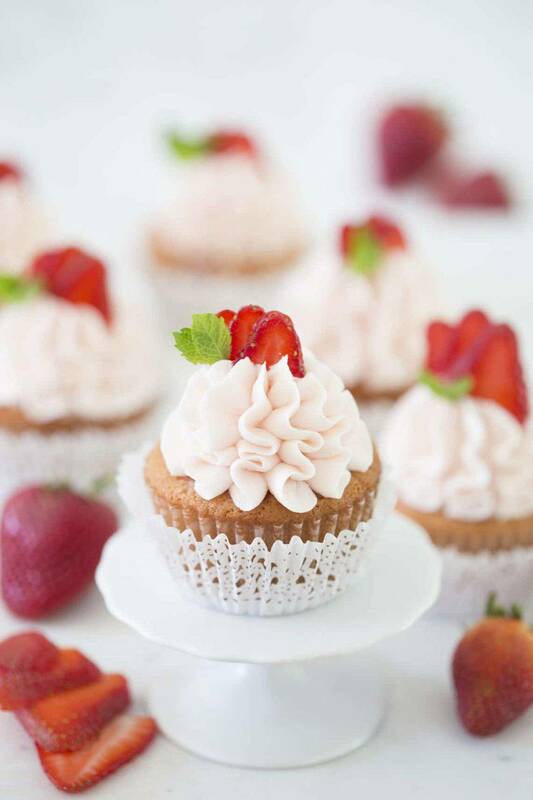 Freeze dried strawberries can be crushed into a powder and used to flavor the buttercream as well. If you’ve tried this frosting out then don’t forget to rate the recipe and let me know how you got on in the comments below, I love hearing from you! Delicious Strawberry Buttercream made with fresh strawberries. Super easy and beyond addictive! 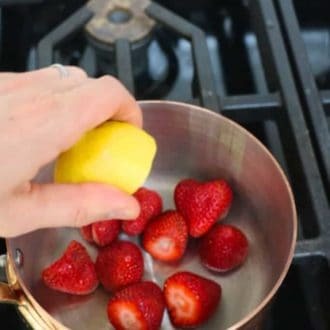 Add strawberries and lemon juice to a saucepan over medium heat. Strain mixture into a bowl. Cover and chill. Beat in the confectioner’s sugar and add in about a ¼ cup of the strawberry reduction. 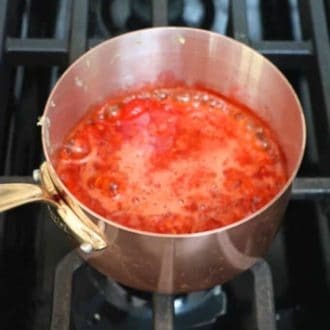 **You can add more or less of the strawberry reduction depending on the color/consistency desired. If you're short on time of fresh fruit you can sub in strawberry jam. Just warm and strain it before adding. If You Loved This Recipe Then Try These Out! Hello! Can you also add in whipping cream to make it lighter? Thanks. 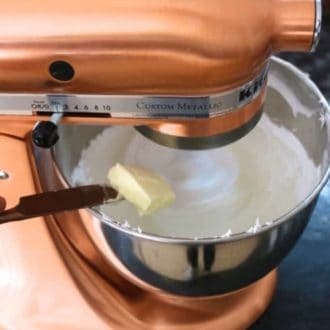 If you want a lighter cream, try whipping the buttercream in a standing mixer for 7 minutes! 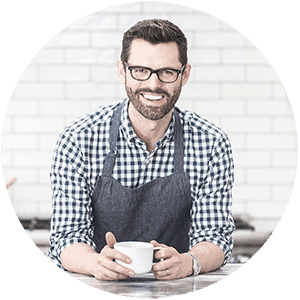 Thanks for the recipe… I made this and it turned out great! Can this kind of texture be achieved with whipped cream? A similar texture with whipped cream and mascarpone.